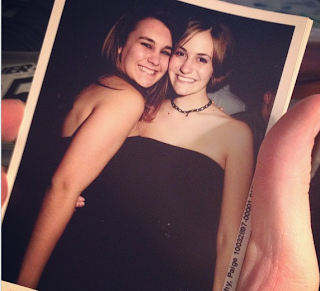 A few nights ago, my friend Paige posted a picture of us from more than 10 years ago on Instagram. A conversation ensued and one of her friends pointed out that she recognized me from LiveJournal. I'm on the left. This is before I started waxing my eyebrows. A trip down memory lane later and I was logged into my LJ account, pouring over entries from a time in my life marked by drama, boys, drama, girl fights, drama, boys, and not nearly enough studying. LiveJournal was my first foray into the world of blogging. (If you can call writing a cryptic, one-line message into Semagic, stating my mood as "depressed," and that my music was Chantal Kreviazuk's "Surrounded" on repeat a "blog.") I actually got in trouble for things that I wrote in my blog (stupidly, unfiltered and public) and I would not be surprised, in reading it over the past few days, if I said some things back then that cost me friendships, relationships, opportunities - who knows? The point is that in reading over entry after entry of mind-numbing blathering on about the same stupid guy and the same stupid fight and the fact that I always, always painted myself as the victim and refused to own any part of the problems in my own life - I found myself being eternally grateful that I grew up. I got older. I learned how to treat people a little better. I learned how to treat myself a little better too. Somewhere along the way I abandoned the selfishness, the penchant for spelling the word "definitely" wrong (every. single. time. REALLY? ), and the emo music on repeat. I have never been so grateful for getting old. Ten years today. 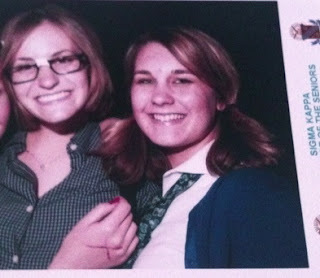 Ten years ago today, I wrote my very first blog entry. I am positive that exactly one person read it - Paige - who first introduced me to LiveJournal. She inspires me constantly to be a better writer, but truly she introduced me to the idea that blogging is writing and some of it (like hers) is freaking beautiful. And, fortunately we dress better now too. In a true full-circle moment, I want to thank you all for the outpouring of support I received on my last blog post. You all have blown me away by how accepting you have been of my truth, but I am truly shocked by how many of you felt the same way as I did when you were only weeks into motherhood. And, similarly, this blog was started on the foundation that I knew there were women out there that went through what I went through and who needed someone to tell them, "It is going to be okay." You all proved to me that I have done what I set out to do with my last post. So, thank you. "It's normal. I feel that way too." So, thank you. Please keep reading. Great Blog! I look forward to reading more. I nominated your blog for the Liebster Award. Check out my blog for details.